Guest blogger Howey McAuley graduated with a BFA in Surface Design from East Carolina University. The best job she ever had was managing school book fairs for an independent bookstore. These days most of her artwork centers around crafts with her children. You can find her on Twitter at @23catsinaroom. Several weeks ago my daughter Boogie (who just turned 5) had a Barbie doll eaten by one of our dogs. Normally this would lead to a meltdown of epic proportions. This time, however, she shrugged nonchalantly and said, “She’s just the Black one.” Keeping my voice calm (while internally freaking out) I asked her if that made the Barbie less important. She said yes. YES. What? Boogie is African American/Caucasian with very light skin and bright red hair. She has hazel eyes. Her little brother Bear is African American. He is very dark. So I then asked if she thought Bear was less important than a white boy. She said yes again. She couldn’t remember why she thought that or where she heard it. I was completely heartbroken. I explained, not for the first time, that she is black as well as white. I told her that some people would see her as only black. We talked a bit about everyone being equally important no matter what they look like. Then she was bored and started drawing. I was completely heartbroken. I tweeted about it. I stewed. I tried to figure out where we had gone wrong. I finally called a friend who is African American and told her about it. She was not at all surprised. She told me that it was normal (normal?) and that black children, especially girls, need to be told that they are important. It isn’t something they just assume. The racial bias is simply out in the ether. As a white couple, when we decided to adopt, race was a non-issue. We just wanted a family. We realized that having an interracial family would come with “extras.” People always look at us. 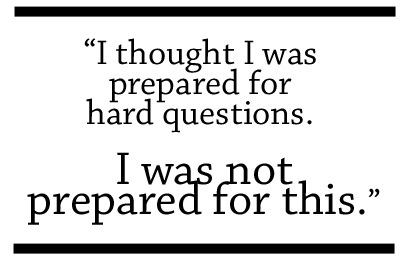 Sometimes people ask questions. Some of those questions have been mildly offensive without the questioner having the slightest clue. We have been more aware of racial bias since having our children. It would be impossible not to be. The world we see in the media is not representative of the real world. In our own home we have been vigilant about having books, toys, and dolls that represent multiple races. We have read numerous books on being white parents of black children. I thought I was prepared for hard questions. I was not prepared for this. Again, we just want to be a family. And we are. Last week another Barbie went the way of the dog. She was black. As I went to throw the Barbie in the trash, Boogie cried out,”No!” I showed her the missing arms and legs. She said she loved the Barbie. She loved her because she was black. She asked if we could buy another to be her sister. Is this progress? Did our discussion sink in? I have no idea but I do have hope. Thanks for another interesting piece. Beautiful story. Thank you for this article. When I read the tagline I went..Uh-oh what do we have here? It is a reality that our children may be raised within a loving and balanced home and yet are affected by outside influences that we have no control. The way you handled it was priceless. You did not over react and you took the time to love her through the process. Bravo. I was just reading a post very similar to this the other day, an update of the old doll experiment. I think it was actually Good Morning America that did the update, or maybe they just reported on it, that black kids still (though not as many) think that the white doll is “prettier” and “nicer” than the black doll. Here’s their report on it. Kudos to taking time to breathe and educate your daughter. All children, no matter the race or gender need to be told that they are important. Not just black girls because of their color but all children because humanity is important! when we teach our young that their color makes them more special than their characteristics aren’t we teaching them to look for a racial divide? Not really, Amie–as the post said, the idea that white is better is already in the ether. Kids tend to pick it up even if it’s never explicitly said to them–it’s the normalization of “white,” the Othering of “black” in our culture that’s the problem. That’s why it’s even *more* important to work against the dynamic that’s already out there. Stacy, Thanks for digging up the old black doll vs. white doll study from the 1940s. I know I had seen it, but somehow I didn’t save it. Thanks to everyone who has reposted or commented. I have been thinking lately about how I perceive things now as opposed to before we had children. I notice the disparity of diversity in the media. I noticed before but sort of a subconscious level. Now I’m like, “where is MY kid on this Advent calendar?”. Then I wonder, if I I was a Black woman would this sort of thing bombard me all the time. Could I ( should I ) put up mental barriers? Is this how racial bias sinks into our society? Am I overreacting? Whew. I don’t know. We just tell our kids the truth, show them how much we love them, and amble on. Howey, I want to thank you for sharing your experiences with us. It is disheartening that these societal stigmas persist but your story does have a happy ending. And really, your family’s story is a shining example of good parenting, leading by example. Walking the walk. One small victory for family-kind! Definitely a slog but worth it. Great job Sis. Always proud that you know the road you’re on and the road to take. Keep looking forward. Here’s another thought: Maybe some races/cultures don’t “assimilate well” (and by that I mean don’t participate in Rockwell-esque American culture) because, as children they understand that they are “the other”. For generations black/brown folks keep to their own American culture & raise their children away from, & even afraid of, mainstream American culture. If children aren’t represented then why on Earth would their parents encourage the family to participate? For example: I didn’t see an Advent calendar until I was in my 20s (baby sitting for white children) because black parents aren’t buying that for their children. There are things that are seen as “for white people/children” cause it’s clearly marketed to them. Until a product is marketed for (or a campaign started to demand the creation/inclusion of) children of color then buying these products won’t encourage these companies to diversify their products. Mattel didn’t just say “Let’s take on the added expense of making a brown Barbie so little brown girls will feel included!” Someone saw the need & either (1) presented a profitable outcome OR (2) forced the issue. Also it isn’t a coincidence that some 2nd/3rd generation Asians assimilate better in the US. While they most certainly experience racism Asian children “grow up white” more easily because they have products that look enough like them. A brown/black haired white doll can be imagined as Asian more readily than imagined Black. It’s a chore to find an Asian doll because there isn’t a demand for one…white dolls will do. The only worry I have about my brown god-children being raised by their amazing white parents is this: if open minded white folks don’t see the inherent othering of their children then do they see the inherent danger in growing up black/brown in America? Black Barbie is an important life lesson for brown/black parents because its the opening to the conversation “America doesn’t care about you. This means you have to be more careful than white kids. Fear the police. Fear bold white people. Keep away from situations where you could even *look* like trouble.” While it’s an unfortunate reality white parents of black/brown children need to issue these warnings too. It’s a vicious, ugly conversation but risking your child’s life isn’t worth the aversion. For this reason I’m happy to be the go-to African American friend. Dana, I wonder what you mean when you say “Also it isn’t a coincidence that some 2nd/3rd generation Asians assimilate better in the US. While they most certainly experience racism Asian children ‘grow up white’ more easily because they have products that look enough like them.” It’s dangerous to suggest that Asian Americans, whatever generation, are closer to whiteness than other non-whites because it renders invisible or less important some of the real hardships we encounter because of our race. We’re othered and bullied (http://nces.ed.gov/pubsearch/pubsinfo.asp?pubid=2011336) and left out for a variety of reasons and in a variety of ways, and I think saying one group is closer to whiteness or doesn’t suffer one or another oppression will lead only to us playing oppression olympics, which is not productive for this kind of conversation. It’s a chore to find a good Asian doll because companies think there isn’t a demand, because the existing white dolls have such huge marketing campaigns behind them, because the Asian ones they come up with aren’t that good, because few companies make Asian dolls. I was fortunate to grow up in a family situation where we traveled to Korea every other year and my parents bought me real Korean dolls. I’m about to give birth to a girl, and I had a very hard time finding an Asian doll that wasn’t made by Mattel or American Girl (same company). I also think it’s unfair to suggest that people of color don’t buy xyz products, that we keep to ourselves, and therefore things are not being made for us. Ethnic enclaves exist because they provide smaller safe spaces in larger unsafe spaces, but as entrenched as we may be in our particular ethnic enclaves, we still live in American society, and there’s no getting away from mainstream products, media and its messages. We’ve been demanding more non-white representation in children’s books for DECADES and yet the numbers have not shifted. We cannot be blamed for this. As an Asian American, I don’t see products being marketed to me because I’m “closer to whiteness” than other people. I see products marketed to me because of real or perceived consumer power (http://www.latimes.com/local/la-me-ff-1206-asian-spending-20131206,0,180429.story#axzz2mj98WvS0). 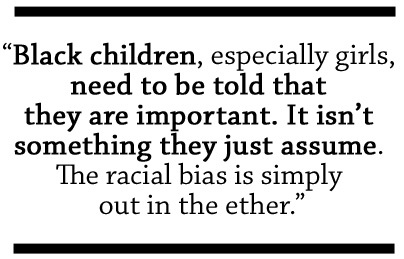 An eye-opening piece on race issues and teaching kids about diversity! I applaud Howey for the way she handled the situation. As a second generation Chinese-American, I wouldn’t say that I preferred “white products” or “white culture” over other products and cultures. My parents bought a diverse range of toys when I was growing up; I had a white Barbie, but I also had a Chinese Barbie and a Japanese Barbie. I loved the cheongsam that the Chinese Barbie came with and I don’t think I would have accepted a brown/black-haired white doll wearing the cheongsam as the same. Perhaps because I grew up in San Francisco’s Chinatown neighborhood, I never felt like an “other,” but ultimately, I think talking to children about race and stereotyping is the best tool to educate and inform them. Non Muslim Blacks are still struggling with racism. Having been victims of white European racism for centuries, they are now involved in Black racism or monkeying white racism. The very existence of “Black History Month”, a white man’s invention and trick to please the Black racists, proves how racist those Blacks are. What if we had a WHITE HISTORY MONTH? Islam abolished colour and other racisms more than 1400 years ago. So the fact that your bi-racial daughter is yet to be valued enough to be represented in the most powerful office in this country, not because she’s part black but because she’s a female completely escapes your notice? Hhhmmm. How very telling. Heather, I think that Howey was suggesting that her daughter needs to be told she’s important both because she’s part black and because she’s a girl. There’s still a lot of gender inequality so I agree that it’s still incredibly necessary to teach all girls that they are important. But girls of color are marginalized on several fronts, so for them it is even more urgent to send them the message that they matter to counter the messages they will absorb that they do not, both because they are female and because they are people of color. Hannah, you are correct about my intent. However, if it comes across more strongly about the racial bias I am not bothered. It was a moment in time that I handled the best way I knew how. With a 5yo it’s important to address the issue quickly, calmly, and in an age appropriate way. I’m sure there will be many of these “teachable moments” in future. I will say, Boogie AND Bear are surrounded by strong female figures. At times, human example can be much more effective than talking. I wrote I’M A PRETTY LITTLE BLACK GIRL!to show our girls as beautiful as they are because of this very situation. There is a need to continuously provide loving and celebratory ways for our children to see themselves with honor and joy. When I read this, it simply said to me again, there is a huge need for books and items that celebrate our young children at early ages, and let them see themselves gloriously — as they are. I applaud you for the way that you handled your situation. You seem like an awesome parent! Well done on the book. You are so right!